Fast on the heels of the passing of Bill 24, the pig industry in Manitoba has begun submitting proposals for new confinement facilities in the province. Sadly, the first, calling for four new barns just outside of Killarney which will hold 40,000 pigs is well on its way to approval. The second proposal, submitted by V.C. Hog Ltd, calls for the building of a new confinement facility for 6,000 pigs just two miles south of Swan Lake. We have a good chance of stopping this barn from being built. Manitoba already has the largest pig industry in the country, producing over eight million pigs a year—a number which doesn’t even reflect the total number of pigs born into the industry, as an estimated 11 per cent die before even leaving the farm. The lives of these pigs were exposed in an undercover investigation at a pig barn in Arborg just a few years ago. The footage showed horrific abuse, including the confinement of pregnant pigs in barren crates so small they were unable to turn around, the mutilation of piglets without any pain relief, and the complete lack of medical attention for sick and suffering pigs. We cannot allow more animals to be born into this. 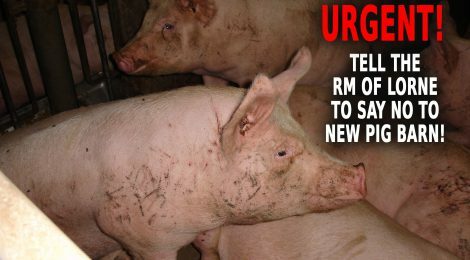 Please sign and share this petition calling on the Reeve and Council Members of the RM of Lorne to protect animals, the environment, and the health of local residents by voting “NO” on the proposed new pig barn. Thank you for speaking up for Canada’s farmed animals!